PERRY TOWNSHIP — When Temple Christian edged Perry last Friday night in overtime, the Pioneers’ celebrating after the game in the locker room could be heard in the hallway. Who can blame the Pioneers? Temple Christian’s win was its first over the Commodores in more than four years and they handed Perry its first Northwest Central Conference loss in three seasons. Overhearing the Temple Christian’s celebration, Perry head coach Matt Tabler said he knows he is the hunted after being the hunter the past three years and admits that teams will be seeking revenge for all the blowouts they endured the last several years and added this is what happens when a team becomes successful and he prefers this than being considered a doormat. Tabler said the postseason run to the state final four last year was a culmination of 11 years of building the Perry program to be one of the better teams in the area. 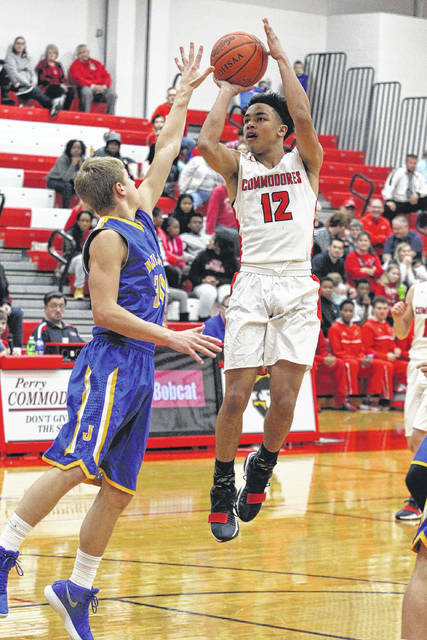 Tabler added that he wants to keep the level of play at Perry among the elite but also understands that a team cannot be blessed with the senior class the Commodores had last year and is looking at his seniors, Logan Dray and Jamal Whiteside. “First, you have to thank the six seniors that helped us get where we wanted to get but it’s now the job of the underclassmen to carry that tradition on,” Tabler said. Dray and Whiteside saw significant minutes in the last four years and will be counted on to provide leadership and experience to the younger Commodores. Other than these two, Perry’s roster is primarily players seeing varsity time for the first time. Tabler added that last year had its ups and downs and that having a senior-laden team he seemed to always have a senior step up and diffuse a situation on or off the court and now it is up to Dray and Whiteside to take on that role. “I think with every minute that guys play this year, the more experience they are going to gain, the more confidence they get that we are going to get better throughout the year,” Tabler said. Tabler admits that with an inexperienced roster that his preparation has changed this season. Last year he said the coaching staff could give the team a lot of information before a game or during practice and they would respond in a positive fashion. With this year’s team, Tabler does not want to overload the young squad. Despite a 1-3 start, Tabler said team confidence continues to grow after each game. Junior Louis Hoersten, who was the Commodores’ quarterback during their successful season, saw limited time on the court last year but is developing into a solid starter. “I see his confidence grew with having a successful football season and being our quarterback and his confidence of getting to the basket from the first practice to the fourth game has grown,” Tabler said. Two other players Tabler points to that are showing improvement are Chaz Jackson, who did not play junior varsity last year, and Martell White. Tabler said this team is still searching for its identity and once it does he expects the wins will become more frequent. This entry was tagged perry. Bookmark the permalink.